LOOK: Historic Nepal Sites Before And After The Quake : The Two-Way The human toll of the weekend disaster is overwhelming, but the temblor also damaged some of Kathmandu's historic structures. More than 4,000 people are dead in Nepal after a devastating earthquake over the weekend. The human toll of the quake is extensive, but the temblor also damaged some of Kathmandu's historic structures. Here are some before-and-after images of some of those sites. Kathmandu's Durbar Square is home to many of the city's main religious sites. The square is one of seven Kathmandu monuments on UNESCO's list of World Heritage Sites. According to UNESCO, the square was built between the 12th and 18th centuries. 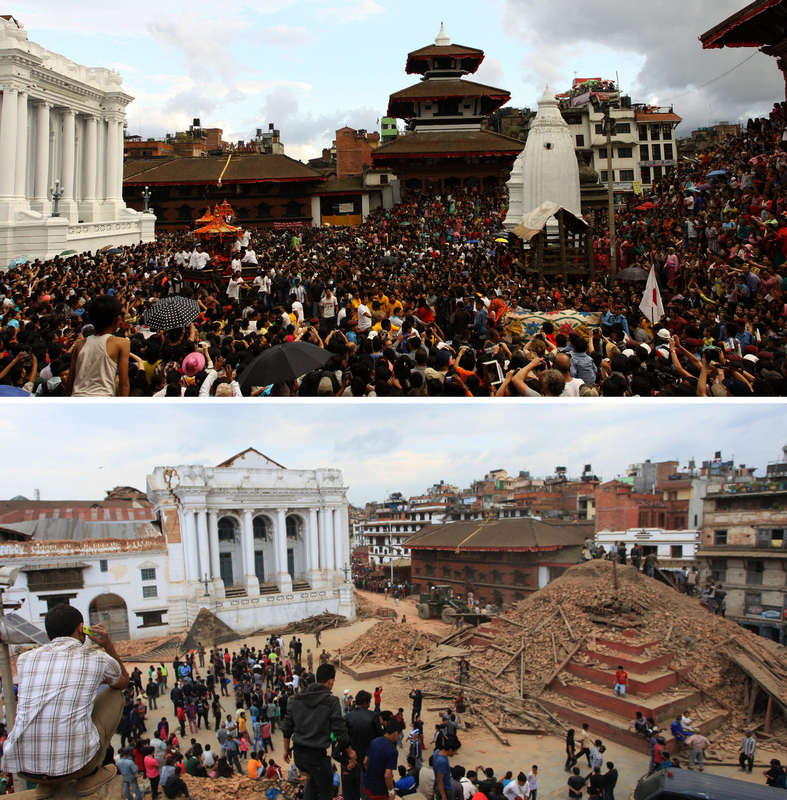 The images below tells us what Durbar Square looked like before the quake — and after it. (Top) Nepalese devotees participate in a procession of chariots of god and goddess Ganesh, Kumari and Bhairav during the last day of the Indrajatra festival at Durbar Square in Kathmandu, Nepal, on Sept. 22, 2013. (Bottom) The ruins on the Durbar Square after an earthquake in Kathmandu on Saturday. Swayambhunath, which was built in the fifth century, is one of the city's two Buddhist centers; the stupa is the oldest Buddhist monument in the valley where the capital sits. 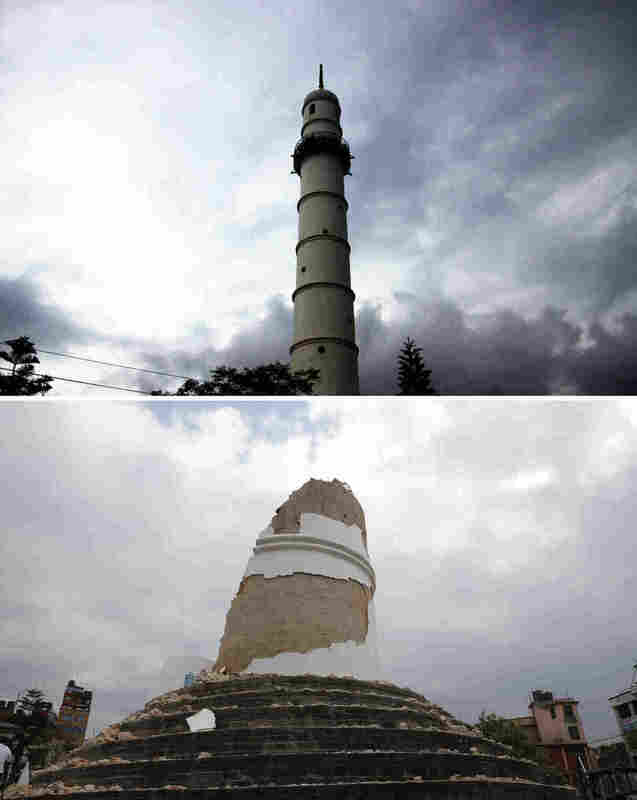 The Swayambhunath complex was badly damaged by the quake, as can be seen in the following pictures. (Top) A dog sits outside the Swayambhunath stupa, an ancient religious complex atop a hill, in Kathmandu on Jan. 27, 2014. (Bottom) A monk salvages belongings Sunday from the rubble caused by Saturday's earthquake at the Nepalese heritage site. The Dharahara was built in 1832 and offered panoramic views of Kathmandu. It was severely damaged in an earthquake in 1834 and destroyed in another quake in 1934, after which it was rebuilt. (Top) Bhimsen Tower, also called Dharahara, is seen in Kathmandu on July 27, 2013. (Bottom) The collapsed landmark on Saturday. For more coverage of the quake, please click here.